2.easy Integration Into A Variety Of Decoration Style,In Terms Of Price And Style Is Very Suitable For Home, Hotel,Office,Restaurant,Bar. 3.The Real Show Of The Product Itself, The Photo Does Not Do Post-processing,The Actual Product Is More Beautiful Than The picture. Candlestick Holders/transparent Heat-resistant Glass,Safe,Reliable,Innovative Style,Transparent And Bright feeling. Heat-resistant Glass,Safe And Reliable,Innovative Style,Transparent And Bright Feeling,Elegant atmosphere. 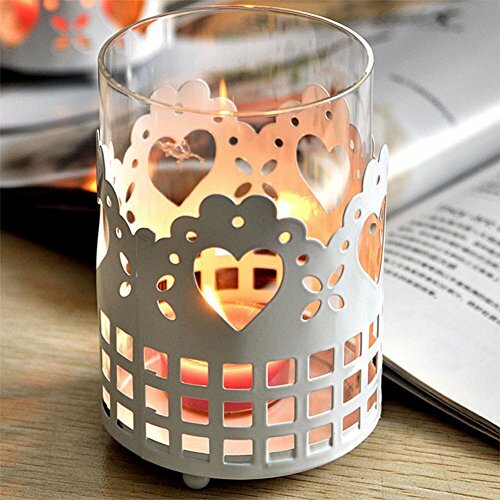 Cup-shaped candle cup with transparent heat-resistant glass,Safe and reliable unique design,And superb metal processing technology integration. These candle holders were packaged very securely and looked exactly as pictured. Unique design,Innovative style,Transparent and bright feeling,Simple shape,Sleek lines.